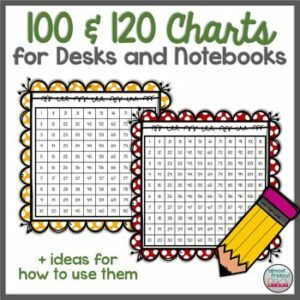 Cute hundred and one-hundred twenty chart printables for your students’ math notebooks and more. This product includes 100 and 120 charts with colorful frames, a black and white version of each, and pages with 4 of each chart to save copies! Also included is a page with ideas to get you started using these handy references in class. Enjoy! And don’t forget to leave feedback about how you use hundred charts in your class.